Outgunned by the Su-30 family of aircraft and suffering critical design flaws, the American F-35 is staring down the barrel of obsolescence – and punching a gaping hole in western air defences. This article is an excellent read to understand how Russia’s technological level is best in its class in many military sectors, especially with regard to fighter jets. It originally appeared in Russia & India Report. The SU-30 continues to be the number one choice among global buyers. Built to be the deadliest hunter killer aircraft of all time, the F-35 has quite literally become the hunted. In every scenario that the F-35 has been wargamed against Su-30 Flankers, the Russian aircraft have emerged winners. America’s newest stealth aircraft – costing $191 million per unit – is riddled with such critical design flaws that it’s likely to get blown away in a shootout with the super-maneuverable Sukhois. Stubby wings (that reduce lift and maneuverability), a bulbous fuselage (that makes it less aerodynamic) low speed and a super hot engine (which a half decent radar can identify) are just a few of the major flaws that will expose its vulnerability during air combat. With more than 600 Flankers (Sukhoi-27s and its later iterations such as the Su-30, Su-34 and Su-35 Super Flanker) flying with air forces around the world, the fate of the fifth generation F-35 seems decidedly uncertain. Aerospace experts across the world are veering around to the view that America’s most expensive fighter development program (pegged at $1.5 trillion) will be a sitting duck for the flankers. “It’s a turkey,” declares aerospace engineer Pierre Sprey in an interview to Dutch television. Few people are as qualified to speak about fighter aircraft as Sprey. He is the co-designer of the F-16 Falcon jet and the A-10 Warthog tank buster, two of the most successful aircraft in the US Air Force (USAF). So far the US has been lucky it has never really encountered a “serious” military. Over the skies of war-weary Iraq, tiny Libya and utterly defenseless Afghanistan, the American aircraft operated with impunity. But luck can run out – if they ever come up against the air forces of Russia, China or India the outcome won’t be so one-sided. In particular, the Indian Air Force has beaten the USAF’s fourth generation fighters using both third and fourth generation jets. KUBINKA (Moscow Region) – Kazakhstan’s armed forces will receive two Su-30 multirole fighters and two Mi-17 transport helicopters from Russia this year as part of existing contracts, Kazakhstan’s Deputy Defense Minister Okas Saparov told Sputnik on Wednesday. “We received four Su-30s from Russia in 2014, two more this year,” Saparov said at the Army-2016 military forum, adding that two Mi-17s would enter into service in 2016, followed by more next year. Moreover, Kazakhstan plans to sign a contract on the purchase of four Russian Mi-35 helicopters by the end of 2016, Kazakh Deputy Defense Minister Okas Saparov told Sputnik on Wednesday. “This year we will sign another contract on four Mi-35s,” Saparov said at the Army-2016 military forum, adding that four of the attack helicopters with transport capabilities planned to be delivered as part of the 2015 contract. Army-2016 military forum is holding on at Moscow Region suburb Kubinka. KUBINKA (Moscow region), September 7. /TASS/. 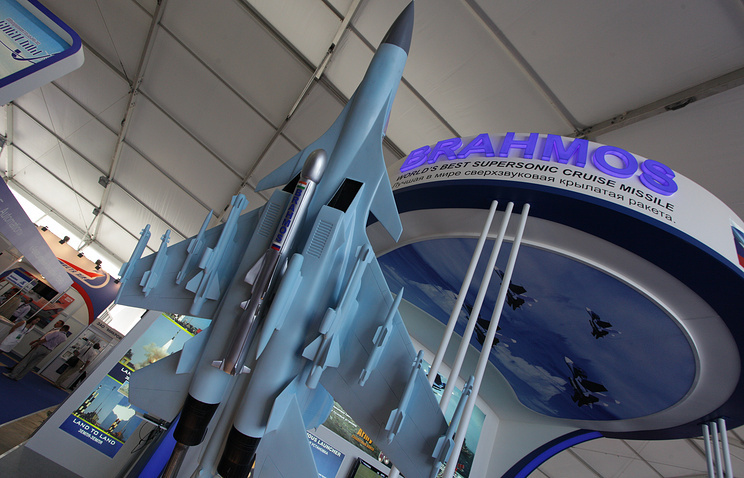 The Russian military are interested in buying the BrahMos cruise missiles, which were developed jointly with India, for equipping its Sukhoi Su-30SM fighters, a military-diplomatic source told TASS on Wednesday. “The new missile strike system – a plane plus a missile – will be first of all made operational with the Indian Air Force. After that the Russian Air Force, which is very interested, may buy the system,” the source said at the Army 2016 forum. He added that the negotiations with the Russian side might begin in 2017 after flights tests of the Indian Su-30MKI fighters with the BrahMos missile are completed. TASS has no official confirmation of the report. The Indian Air Force fighter with a demonstrator of the BrahMos missile’s air-launched version performed the first flight in summer 2016. The first aircraft launches of the missile are expected to take place before the year end. India plans to equip three regiments of the Su-30MKI fighters with the updated missiles. The Indian military currently have in service the missile’s ground and sea-launched versions. The Su-30SM multifunctional fighter is an upgrade the export Su-30MKI version. It was improved in line with the Russian Defense Ministry’s requirements regarding the armaments, radar, communications, IFF transceiver systems and other equipment. The first contracts on the supply of the Su-30SM fighters to the Russian army were concluded in 2012. The Sukhoi Su-30 (NATO reporting name: Flanker-C) is a twin-engine, two-seat supermaneuverable fighter aircraft developed by Russia’s Sukhoi Aviation Corporation. It is a multirole fighter for all-weather, air-to-air and air-to-surface deep interdiction missions. The Su-30 started out as an internal development project in the Sukhoi Su-27 family by Sukhoi. The design plan was revamped and the name was made official by the Russian Defense Ministry in 1996. Of the Flanker family, only the Su-27, Su-30, Su-34 and Su-35 have been ordered into serial production by the Defense Ministry. All the others, such as Su-37, were prototypes. 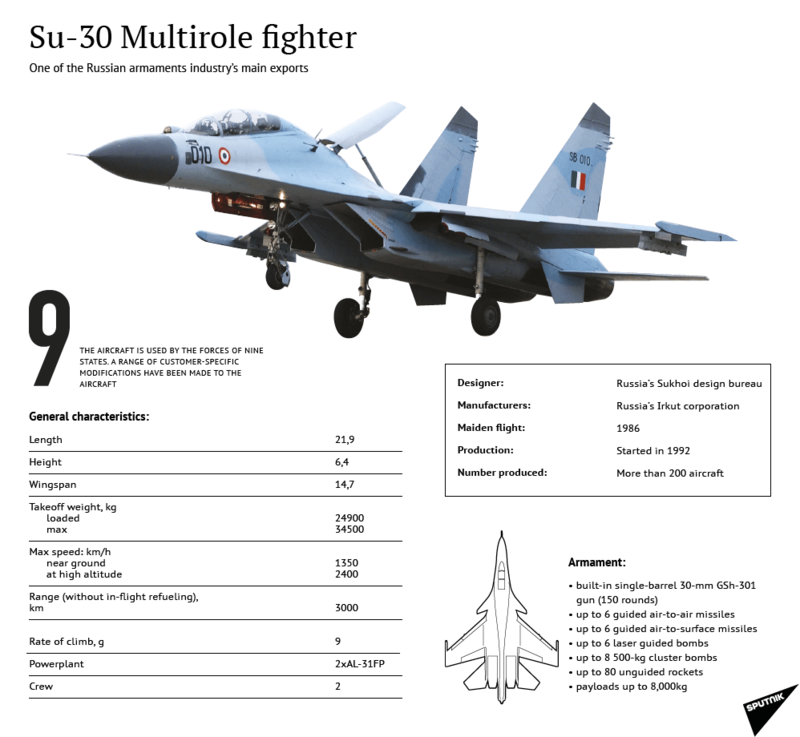 The Su-30 has two distinct version branches, manufactured by competing organizations: KnAAPO and the Irkut Corporation, both of which come under the Sukhoi group’s umbrella. 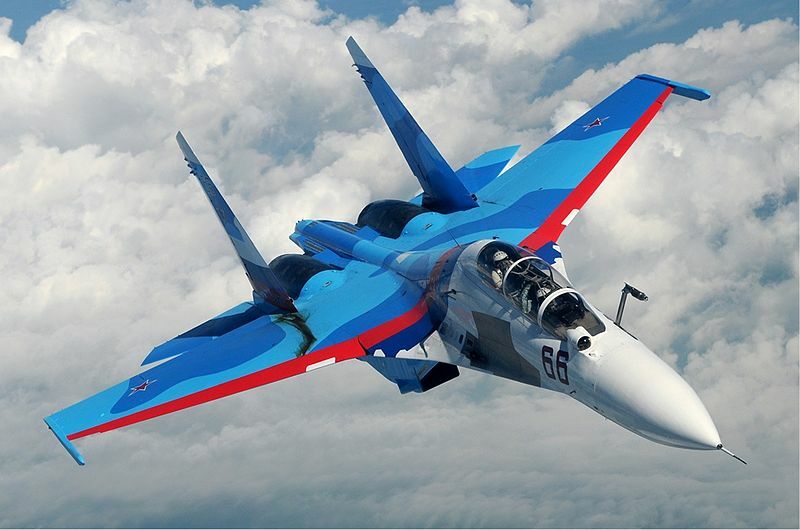 April 5 – Russia has filed no applications with the United Nations Security Council for an approval of sales of Su-30 fighter jet to Iran, hence, the United States’ threats to clock this deal is just a speculation, a well-informed source at the Russian foreign ministry told on Tuesday. “The Russian side has filed no applications with the United Nations Security Council for approval of sales …of Su-30 fighter jets to Iran. There is no such item on the agenda,” he said. “The sale of Su-30 fighter aircraft is prohibited under UNSCR 2231 without the approval of the UN Security Council and we would block the approval of any sale of fighter aircraft under the restrictions,” Shannon told Foreign Relations Committee hearing. Moscow and Tehran will sign o contract on the delivery of Su-30SM multirole fighters to Iran this year. MOSCOW (Sputnik) – A contract for the delivery of Russian Su-30SM Flanker multirole fighters to Iran will be signed in 2016, a high-ranking official in the Russian Federal Service for Military-Technical Cooperation said Wednesday. “Iran has actually expressed its interest in the purchase of an order of Su-30SM fighters, but so far the parties are only discussing the issue in negotiations. The contract will be signed this year,” the official told RIA Novosti. On February 11, a source in the Iranian Defense Ministry told Sputnik that the country’s defense minister planned to discuss Iran’s need for Su-30s and hopefully sign a procurement contract for them during his Moscow visit.The Su-30SM, commissioned in 2013-2014, is a two-seat derivative of the Su-27UB jet, capable of air-to-air and air-to-ground strikes and can be equipped with a wide variety of precision-guided munitions. Russia and Iran stepped up their military cooperation last year after Tehran reached a deal with six world powers to scale back its nuclear research in exchange for an easing of sanctions against it. A number of new planes will be added to the squadron of Sukhoi Su-30SM multirole interceptors deployed in Crimea, the Black Sea Fleet Commander, Admiral Alexander Vitko, said on Friday. Prior to Crimea’s 2014 reunification with Russia the Ukrainian authorities opposed all attempts to upgrade the Russian Black Sea Fleet based on the peninsula. “The Su-30SM fighter jets are doing more than just adding luster to our military parades in Sevastopol, they are actively being used during exercises,” Admiral Vitko told RIA Novosti news agency. He added that this year more planes would be added to the squadron of Su-30s currently deployed on the peninsula. Admiral Vitko said that in the past year the Fleet’s pilots had flown hundreds of sorties clocking 5,000 hours in the air which he described as the best such performance in a decade. “Our pilots have flown over 200 antisubmarine missions, launched hundreds of unguided missiles and performed numerous bombing missions. Our helicopters have flown over a hundred sorties taking off from and landing on ships,” he added. The Su-30SM is a multirole fighter for all-weather, air-to-air and air-to-surface deep interdiction missions. The Su-30SM can conduct electronic counter-countermeasures and early warning tasks. The aircraft also acts as a command-and-control platform within a fleet of combat aircraft performing joint missions.